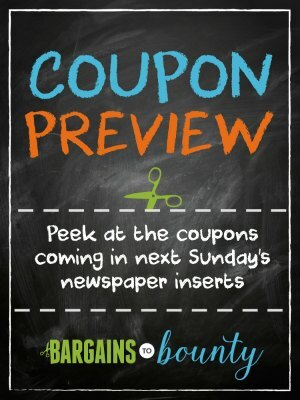 You can look forward to THREE COUPON INSERTS this weekend: 1 SmartSource (SS) insert in the Sunday paper – along with 2 RetailMeNot (R) inserts (which will hopefully appear in your mailbox)! The following week (Sunday, February 17), there will be NO coupon inserts. Here’s a peek at what you can expect! *NOTE: In many areas, RetailMeNot inserts are no longer included in the newspaper, but rather sent via postal mail with other ads (or not at all). Read more about this change. RedPlum was rebranded as RetailMeNot Everyday on March 25, 2018. Learn more about the new RetailMeNot Everyday inserts here. You may want to build your coupon collection by purchasing extra newspapers, especially if you find there are a number of coupons you’ll use. Remember that coupon selection and values vary according to region, so your paper might not include these exact coupons (though it’s a reasonable estimate). In general, newspapers with larger circulation will have better coupons, but you’ll want to check the papers in your area to be sure. Check your local dollar store – they may still be selling papers for $1.00. Some locations have stopped carrying them, but many Dollar Tree stores still have them available (call/visit your store to confirm). Always check that the papers include coupons before buying. Recently, Dollar Tree Sunday papers have not contained coupons. Ask your friends, coworkers and family members for coupons they’re not using. Find a friend (or group of friends) willing to trade coupons with you. Wondering how to organize your coupons? Or when you can recycle expired whole coupon inserts?